Aside from fried gram coated gobi (cauliflower) or maida (all-purpose flour) coated gobi for Gobi Manchurian, the only other way I cook cauliflower is parboiling it - a rather quick and easy meal seasoned with salt and black pepper powder. It's delicious also. Last night, instead of having it the same way again, my husband brought out an excellent idea -a different way of making cauliflower dish but something that is not entirely new because we've been having tandoor salad (without tandoor...lol). I still say it was an experiment that, I confidently recommend, turned out very well. In fact, it was superb we decided to make cauliflower this way. 1. Make small florets out of cauliflower. Wash properly. 2. Parboil the florets with salt. (Make sure they are not over-cooked). 3. Strain and keep aside. 4. When water is drained, heat pan and add a tbsp. of oil (I used olive oil). 5. Sautee parboiled cauliflower florets for 2-3 minutes being careful not to roast. While mixing, add black pepper powder. 6. Turn off the stove. 1. Wash all vegetables thoroughly. 2. Slice them into thin and long pieces. 3. Put all sliced vegetables in a deep bowl. 4. Add lemon juice, black pepper powder, salt, a tsp. mango powder, and a tsp. olive oil. Mix together. 5. Boil water in a deep pan and keep the bowl of this mixture. Parboil for at most 2 minutes or till al dente mixing frequently. 7. 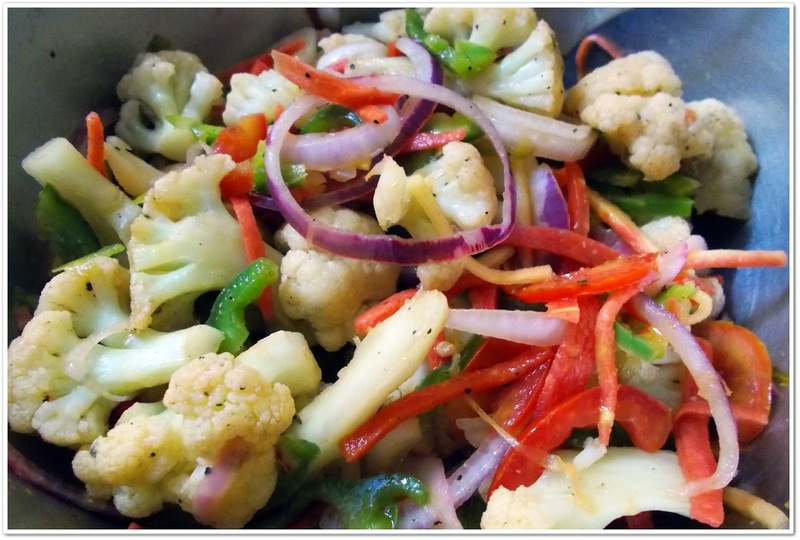 Finally, add sauteed cauliflower florets to the vegetable mixture. 8. Mix and serve hot/warm. Enjoy an easy and healthy meal. No rice required!